These 2 Underneath the basket inbounds plays below are from the the Duke playbook that was compiled by Scott Peterman. The plays are taken from the Men’s Basketball HoopScoop Olympic Playbook. That is among the eBooks that you can choose from to Bundle in our back to school eBook special. This week’s eBook bundle is create your own bundle by selecting any 2 of the eBooks that we have featured over the past few years for $25.00. I have reworked the page that lists the eBooks to make it easier to see all of the choices. Click here for the choices. If you have any problems, or want to include eBooks that are not listed, email me ([email protected]), or call/text me at 765-366-9673. 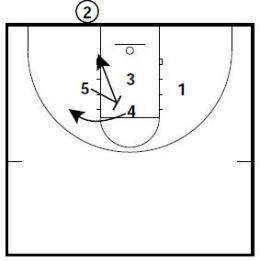 5 sets a backscreen for 4. 4 pops out to the left wing. 5 steps back to the basket. 1 pops out to the right wing. 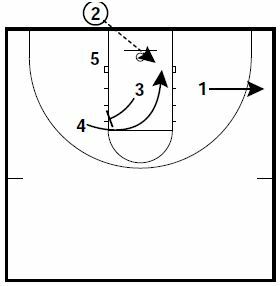 3 sets a backscreen for 4. 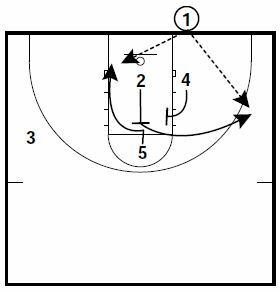 4 cuts to the basket/right low block. 2 sets a back screen for 5. 5 cuts to the left low block. 4 sets a cross screen for 2. 2 pops out to the right wing. 1 can pass to 5 on the block or 2 on the wing. This sample is from the Duke Playbook from Scott Peterman. The plays are taken from the Men’s Basketball HoopScoop Olympic Playbook. That is among the 40 eBooks that you can choose from to Bundle in our back to school eBook special.